"This shoe delivers a well-measured blend of comfort (padded tongue covered with 3D mesh) and aggression, with its downcurved asymmetric shape for powerful edging. 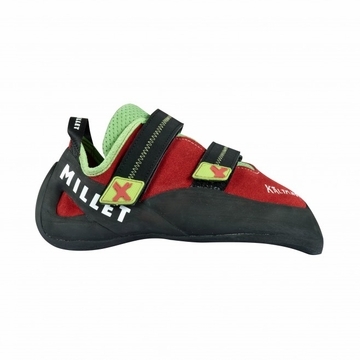 The unlined leather upper offers second-skin feel; the 4 Points Grip rubber developed by Millet combines adhesion and long service life; while the heel stiffener is perfect for pushing down. And the Kalymnos is super-quick to slip on and off, thanks to two highly effective velcro closures. So, Sebastien, where can you take the Kalymnos, To Greek crags. Everywhere! replies the design-center chief. Its very technical, easy to use, and comfortable very much an all-rounder. Its aimed at the general public, for a wide spectrum of use, but also offers serious technical assets ideal when you're pushing your limits, to go a step further.